Home Headlines HERO: The Adventurer’s Journal is now on Kickstarter! HERO: The Adventurer’s Journal is now on Kickstarter! The Italian publishing house Isola Illyon Edizioni is ready to bring HERO: The Adventurer’s Journal all over the world! 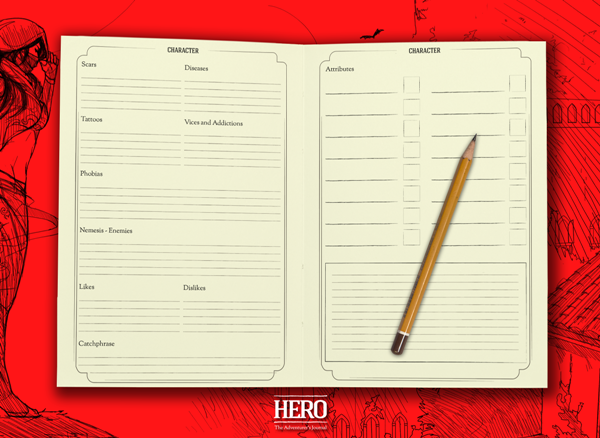 HERO: The Adventurer’s Journal is the ultimate solution to the many frequent issues met by all roleplayers: it consists of a journal in which comfortably write down everything about one’s Campaigns and Characters, keeping all necessary information handy and well organized and finally ditching stray and scattered sheets of paper. Bound in an elegant hardcover edition, the journal is easy to customize and is built so to adapt to all RPGs on the market. The 208 pages of HERO can fit up to 3 different characters because of a structure comprised of a ‘CHARACTER’ section (in which to keep track of all the attributes of one’s own fantasy alter ego, his or her background, inventory, skills and much more) and a ‘CAMPAIGN’ section (in which to take notes about places, people met and other informations about the active campaign, session by session). It is furthermore possible to alter the look of characters and their gears by drawing them on the dedicated silhouette page, and there’s no lack of grids for one’s cartographical needs. This structure is included three times in the journal, so to keep track of the details and tales of three different characters. A series of stunning artworks are included to enrich the journal, contributing to make HERO an elegant product that can’t be amiss in the bag of every adventurer worth their salt. Since the structure of the journal is already developed, if this international edition of HERO will be successfully kickstarted, the company expects to complete the project and proceed with the shipping phase in a very short time. About Isola Illyon Edizioni. The company, established by Luca Scelza and Mario Ferrentino, is an Italian fantasy products publisher. It has just successfully completed another crowdfunding campaign for “La Dama Nera”, the first expansion book for the dark fantasy RPG Awaken; Isola Illyon Edizioni is also the Italian publisher of the award-winning noir RPG City of Mist.